See why every child and parent wants to buy the amazing Lamborghini 12 volt ride on truck Jeep style ATV with Magic Cars® remote control parental feature. 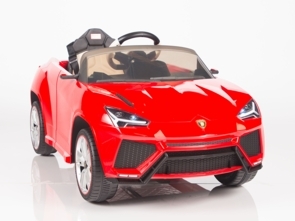 Perfect for children that are ages 1-8 as this Lamborghini truck is easy to maneuver. That's right, Magic Cars® ride on cars and trucks come with a full function remote control that lets you take control of the Lamborghini Uris right from your hand! Want to let your child control the car instead? No problem, flip the switch in the car and the young driver gets full control. Watch the official TrendTimes Magic Cars® RC ride on car commercial below and enjoy what is so amazing. Just like a real Lamborghini ignition with push to start for kids to have more fun starting the electric motor while adding to the overall realism of the Lamborghini ride on truck! You will love the authentic Lamborghini logos and ornaments on the car. Still want more? This amazing Lamborghini comes with working stereo, extra padded Lamborghini seat, authentic Lamborghini steering wheel, seat belt, and Lamborghini wheels for just $399 for a very limited time! Do not be fooled by imitators, only official Magic Cars® sold on TrendTimes.com come with the Best In Class 1 year bumper to bumper warranty for free! The superior design and quality of the Lamborghini is perfectly transferred to this miniature version that is sure to turn the heads of everyone you drive it by. Buy today and we will upgrade your stereo so you can plug in your MP3 player, iPod, iPhone etc and enjoy your own music. Measures 48 inches long, 24 inches wide, 17 inches high, and holds up to 85 pounds. Choose from your favorite Lamborghini colors such as red or yellow. Based off of the real Lamborghini truck, this rechargeable battery operated ride on car is sure to provide many hours of awesome playtime. Combining the utmost care in safety with the maximum driving experience, this product leaves those other car brands trailing behind in the dust. Looking spectacular at all angles. The full size Urus for adults can go from 0 to 60 MPH in about 3-4 seconds and the ride on version, with its superior styling and performance, will have kids feeling the same accelerating exhilaration as if they were in the real Lamborghini! Comes with remote control, foot accelerator, electric brake, forward and reverse gears and a top speed of 5 MPH. Drives forwards, backwards, left, and right. Product Size: 48" x 24" x 17"